Discussion in 'Cinestar Misc' started by Dave King, May 14, 2014. Hey, Michael, it’s best to keep these discussions in the clear so us peeps can see answers to these questions. Might I ask that you respond to Dave on the thread? Thanks! Sorry about that Steve. I had sent Dave a message a couple days ago to see if he was OK on his motor and prop directions and offered to get on a phone call with him to help double check things if he would find that useful. Today while I was out working, he asked if I was around and if I could send my number for him to call. I sent it to him in that message and when I saw his recent question on this thread I just replied that I had send him a PM (my phone number) to make sure he noticed it. I think sometimes its just easier to talk someone through something like this over the phone and for guys like you, Dave and the others who are so helpful to everyone on the forum I'm happy to do that. I will tell you that I have been thinking about coming up with something that helps first time X8 builders get a quicker understanding of the key things to know...a little X8 cheat sheet or cliff notes of some kind. Seems lots of people are interested in pursuing X8 set ups. Dave: In the image above, Prop 1 must rotate clockwise. Prop 2 must rotate counter clockwise -- the "leading edge" of each prop is the one that is closer to you if you look down on the prop from above. (Also, for this prop, the leading edge is the straighter of the two edges). So in your image above, the edge nearest where you have the text "Prop 5 CW" is actually the trailing edge of the prop. The leading edge of the prop blade is to the right , so it must move to the right (counter clockwise) to generate lift. 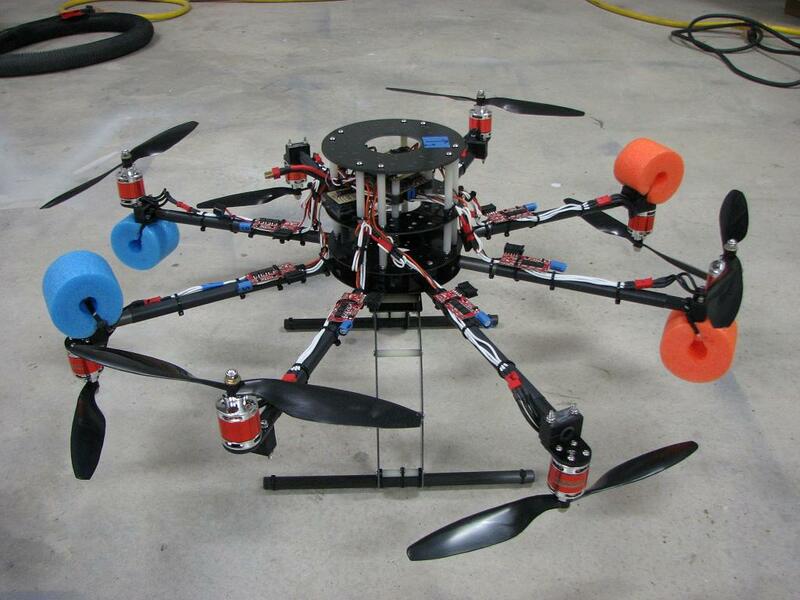 I have quite big flat frame octocopter cinestar type with 16" propellers and t-motor u7 420kv motors. It has 120 cm frame size. I would like to change the propellers in it to 18" to have longer flight time. I can use longer booms but the copter will be to big for my car so I am wondering about using the same booms but 4 motors up and 4 motors down like in the picture in attachment. Is that setting is as efficient like flat octo or I will lost same flight time like on coax setup ?? What kind of mixer I should use for such setting ? I am using Mikrokopter FC. I think you might have better luck getting a response by posting on the Mikrokopter forum (http://forum.mikrokopter.de/). I suspect most of the forum members here no longer use MK flight controllers -- the Cinestar aircraft (which did use MK FC) is a previous generation. Forensic Software & sUAV / Drone Analyst : Photographer : Videographer : Pilot (Portland, Oregon, USA): Trees=2, Ground=1, Props=11. Forum of mikrokopter in English is not popular. I have a filing that here I can find more advanced users.The question is also for other autopilots. Mixers are also in others FC and change in efficiency should be be independent from autopilot.